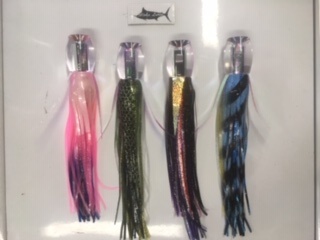 Aloha Beauty lures,12 inch As lures are hand made and custom skirted please email us for colours available In the wiggle and swim category, nothing beats a Beauty. Designed to run with a tight side-to-side motion this explosive swimmer will catch ono, mahi and those finicky marlin. Winner of thousands of dollars in Gulf tournaments and a star in the 2002 San Juan International, this is a proven competition winner. The Medium Beauty is one of the oldest and most reliable designs. 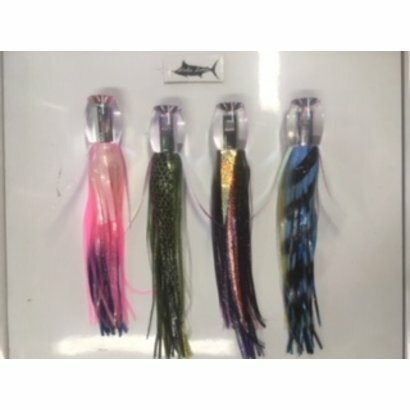 This lure runs well in all sea conditions. Favorite position for the Beauty is short corner or short rigger.